The combination of a surge in Japanese exports to all parts of the globe, a deliberate strategy of encouraging land prices to rise, combined with low property taxes and the concentration of all organs of government and headquarters of major companies within Tōkyō meant that, by fiscal 1987, the market value of land in Japan was 4.1 times greater than the total land area of the United States, a country twenty five times larger. Banks lent lavishly to landowners in the belief that prices would always rise. Speculation in both land and stocks was pervasive, and with this speculation and the prospects of easy money came the jiyageya, half-businessmen, half-gangsters, who bought up adjacent small plots of land, then built apartments, which were sold at gigantic profit or lent to the rich at exorbitant rents. Even legitimate businessmen were not loath to use yakuza gangsters in their zeal to clear out homeowners or tenants who hindered the route to profiteering. The Jimbōchō area is famous for bookstores. It was home to families that had lived there for generations, until the jiyageya began to force them out. Tactics included threats, incessant phone calls, daily visits to the owners of the desired piece of real estate, music played at high volume throughout the night, and sometimes arson or crashing trucks through walls and shop windows. Jiyageya also paid hundreds of millions of yen to induce tenants to sell out, for time was of the essence – the quicker an area could be “redeveloped”, the quicker a huge profit could be made. In 1990, in the aforementioned Sanbanchō area, two tenants refused to budge from their home in a prefab apartment on the top of a three storey concrete building. The area of land was just 53 square meters. The standard formula used to calculate compensation led to a payment offer of $435,000 to move out of a tiny ramshackle rooftop dwelling that could only be approached by ladder… and the tenants refused! Occasionally, there was stalwart resistance; in most cases residents succumbed, seduced by huge sums of cash, intimidated by pressure and the inordinate fear of the yakuza that pervades Japan. In these circumstances, the appearance of the centre of Tōkyō changed rapidly. During the 1980’s and early 90’s, in any direction, construction cranes could be seen silhouetting the skyline. Prestigious buildings such as opera houses – for a people who knew little about opera – museums and art galleries were constructed in all of Japan’s cities and large towns. Throughout Japan, these attempted to exceed the finest in the West, though rarely with any deep understanding of the culture being emulated. During the bubble, inhabitants of large Japanese cities could be divided into two categories; those who were in senior management positions, worked in lucrative areas of the economy or else owned their own business and, above all, owned land, and those unfortunates, the majority, who could never afford to become householders. Almost as wretched as the latter were those who had bought a house on the outskirts of the city and were forced to commute for three or more hours a day. Landowners, who had usually inherited from parents, could take longer holidays, had more spending money, and could think about purchasing a second house. Work colleagues on equivalent salaries would be in sharply contrasting situations if one had inherited land and the other had not. Japanese who had saved diligently in hopes of becoming house owners saw their dream destroyed by the relentless rise in land prices. In 1989, the cost of a thin walled 60-square metre apartment was a stunning $498,000. 95% of the purchase price was for the land. Since the early 1970’s Japanese office workers have been allowed to take on a mortgage debt up to 12.9 times their annual income. European and American mortgages are rarely more than three times yearly salary. Between 1970 and 1984, incomes rose four fold, but mortgage debts increased 15 fold. In many instances, the designer-clothes-clad Mercedes Benz owners were individuals who had abandoned hope of ever being able to purchase their own property, and so bought clothes and imported cars as compensation. Even those who did manage to purchase a house could often not pay off the mortgage within their lifetimes, and so mortgage payments are paid off over two generations. During the bubble period, the government allowed a mass psychology to gain control of the market, an occurrence that was doubly dangerous because the Japanese tend to take actions as a group. Hitherto wise businessmen began to make aggressive and speculative purchases with a view to making quick profits, based upon a conviction that the price of land and the value of stocks would continue to rise indefinitely. Anyone who had the means and did not partake was thought extremely foolish. As long as the value of the stock market continued to rise, more money could be borrowed to purchase even more stocks, creating a multiplier effect. When the stock market lost 60% of its value in just 6 months, and then land prices plummeted, corporations and shareholders were left holding essentially empty assets. If one image can summarize the entire 1980 to 2000 period it would be a graph illustrating the value of commercial land during that time. Imagine an elongated Matterhorn, its slopes rising steadily during the early 1980s, then steeply in the late 80s, until a pronounced peak in early1991. After this, a steep dive followed by a slow steady decline to the foothills of early 1980s prices. In 1989, the Nikkei Stock Index reached an all time high of 38,957. Contrast that with March 2009, post-Wall St crash, when the Nikkei briefly bottomed out at 7,055. Though the Japanese stock market was grossly overvalued during the late 1980s, it was mainly the feeding frenzy of land speculation that caused massive bank debts when the bubble burst. The value of any piece of realty can only be what people are willing to pay for it. No matter how wealthy a nation has become, prices can only be leveraged up for so long. Businesses and wealthy individuals sometimes bought real estate without necessary collateral, on the assumption that it could be sold to some sucker at a higher price. Eventually, the hot potato could no longer be passed on. What remained were relatively worthless assets and the bill. 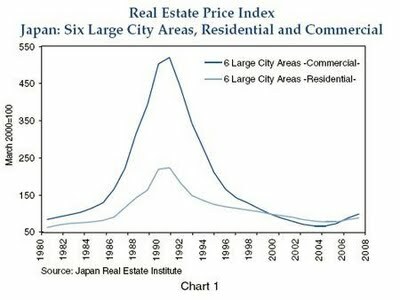 Real estate values were allowed to underpin so much of the Japanese economy that any sharp fall created a vicious downward spiral that eventually forced further reductions in land prices. It was the sheer scale of this mass folly, together with government procrastination and unwillingness to make tough decisions in the aftermath, which caused Japan’s subsequent recession to be so severe and prolonged. The post-bubble recession was made far worse by a massive capital-spending binge that continued well into the 90’s. Companies took advantage of the surging stock market to raise cheap, equity-linked debt and invest almost 20% of GDP. The principal reason for this was that the financial system and tax regime encouraged it. The result was that corporations squandered fortunes on automation and labour saving devices, built factories that ran far below capacity, and office blocks that contributed nothing to productivity. Huge projects planned in the 1980’s went ahead in the early 90’s because aborting them would have been exceedingly difficult; rather like the momentum of a giant oil tanker causing it to need fifteen miles of ocean to come to a halt. This capital outlay also continued because many could not believe that the dream was over. When the bubble burst, banks were forced to expropriate Western masterpieces, bought at highly inflated prices, in lieu of unrepaid loans. Tens of thousands of paintings, including works by Picasso, Chagall, Matisse, Braque and Renoir, worth at least $3 billion on today’s market, were sequestered and stored in underground vaults. During the 1980s, golf courses offered an opportunity for rich Japanese to display their wealth. As Japanese land prices were astronomical, averaging about $82 million per small 18-hole course, many clubs were built by borrowing money from future members. Prospective candidates were required to deposit between $49,200 and $820,000. Despite this, demand far outstripped supply: golf memberships were bought and sold like stocks, sometimes for outrageous sums of money. Prospective members’ deposits were used, not only to create the course, but also to invest in real estate and stocks. The economic nosedive left some course developments incomplete, the club in receivership. When investors demanded a return of their deposits, the corporations owning the clubs were unable to pay. Some members had invested using borrowed money which they couldn’t repay, or used their savings, or even mortgaged their homes. During the 1990s it was estimated that $78 billion of refunds eventually came due, as increasing numbers of golf clubs went bankrupt. Because of the mass psychology of the bubble period, Japanese banks were persuaded to make loans to projects that in their hearts they knew were dangerous. Unwilling to have these risky loans on their books, with the aid of the government, the banks set up wholly or partially owned subsidiary finance companies called jusen, gave them unlimited credit, and then fobbed off any unsafe loans. This violated every principle of consolidated accountancy, but the banks’ books looked good and shareholders remained satisfied. As parent and subsidiary corporations kept different sets of records, the real financial situation remained unclear until years later, when the debt crisis became frighteningly severe. Besides jusen affiliated with banks, there were also many independent ‘non-banks’, which lacked resources to cushion themselves in times of adversity. Many of the nōkyō agricultural credit cooperatives lent massively to jusen without any collateral, in the belief that they would never fail, since they were “subsidiaries” of the Finance Ministry. During the late 1980s, jusen were said to be relending 60% to 70% of the loans they received to speculators, to enable them to buy up real estate. When land prices went into a tailspin, the jusen began to fail, threatening to bring down the entire Japanese banking industry. The debacle cost the Japanese taxpayer US $5.68 trillion to help dispose of losses inherited in the process of liquidating seven failed jusen. Construction companies had also extended huge loan guarantees to jusen on behalf of subsidiaries and property developers. With the collapse of numerous development schemes, 70% of such loan guarantees went sour, leading to a total debt of more than $410 billion for the industry as a whole. These delinquent debts threatened to have a devastating effect on Japan’s economy, affecting 10% of Japan’s workforce. In the 1990’s, many of the Japanese government’s repeated attempts to resuscitate the economy, principally via massive investment in public works projects, which to the casual observer appeared inept and inordinately wasteful, were operations aimed at securing the rural vote that kept the LDP in power decade after decade. It was no coincidence that banks and construction companies were major donors to the LDP, and that nōkyō were a vital element in LDP electoral success. Decade-long recession or not, first priority goes to protection of rural fiefdoms. And so, as the bubble collapsed in 1991, Japan entered a protracted 12 year recession, its so-called ‘lost decade’. At one point its banking system was very close to collapse. The unique circumstances that inspired ‘Japan as Number One’ have vanished. Post-March 2011 and Fukushima, the Bubble Era seems a distant mirage but, for that brief period, Japan’s economy seemed unstoppable. It was a lot of fun to have lived here while it lasted.